How does the Orlando Dermatology Center define itching? How do dermatologists treat itchy skin? First a doctor must try to determine the cause of the itch. An examination of the skin will be required and possibly a blood test or biopsy. If the itch is from a skin disease then treatment of the disease itself will generally relieve the itch. 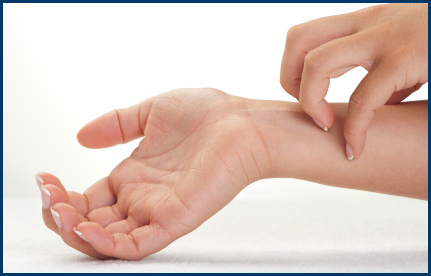 Internal medication may be required if the itch is a symptom of an internal disease. In other cases ultraviolet light treatments may be used to relieve itch.